The ceiling panel is approximately 8' x 4' and is in the entry hall of a private residence in Rancho Palos Verdes, California. 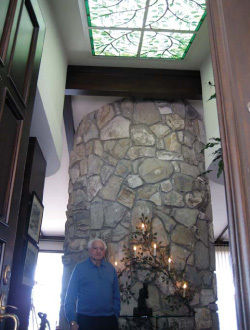 The design challenge involved picking up on the decorative metal artwork that has been featured on the homeowner's fireplace (shown at right) for many decades and depicting a complementary version in stained glass. Ancient Arts (http://www.ancientartsstainedglass.com) was recently featured in The Stained Glass Quarterly, a publication of The Stained Glass Association of America. Founded in 1903, The Stained Glass Association of America (SGAA) is a professional trade association whose membership consists of the finest architectural stained and decorative art glass artists and studios in the United States and around the world. The SGAA actively works for the betterment of the craft of stained glass and architectural art glass. SGAA's award-winning publication, The Stained Glass Quarterly, has been published continuously since 1906 and is the oldest stained glass magazine in the world.